Do you want a unique theme that sets the night apart from the usual hen stuff? If your answer is yes, then, the Angel hen party theme will be perfect for you! Besides being a cool theme, it is not that difficult to dress up for it. So, how do you dress up for it? Just dress in white. Then, add in some accessories like a halo and wings. If you do not know where to start searching for those accessories, take a look at our online store. You will actually find more than just accessories there as we have almost everything that has anything to do with hen parties. 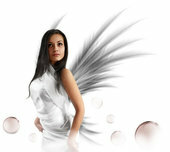 So, do without those devilish acts and be an angel for the night!